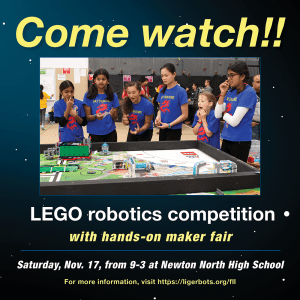 It’s that time of year again when the LigerBots host a FIRST LEGO League tournament. We do this every year and it’s a great time. This one is a “qualifier” round with the Eastern Massachusetts State Championship coming up in December. On Saturday we’ll have a maker fair with a ton of hands-on STEM activities. So if you’re thinking “what am I going to do with my kids on this weekend before Thanksgiving?” we have the solution! This is not only a great time for the 300 or so 4th through 8th graders competing AND for the dozens of high school students running the event, but for any kids who are interested in having fun. We’ll have a number of hands-on STEM activities to try. We’re making cool paper airplanes, working with 3D printing, doing origami, and will even have a “PB&J robot”! We’ll be there from 9 until 3, but I recommend coming in the morning as that’s when things are really hopping. If you miss it don’t worry, we have an even bigger event coming up on December 15.